First Line: Heaven and earth conspired to expose Ernst Richter's corpse, the universe seemingly intent on reaching out a helping hand for justice. When the plastic-wrapped corpse of tech wiz Ernst Richter is found in the sand dunes north of Cape Town, the case becomes the focus of intense media speculation. Richter was the creator of an internet service called MyAlibi which provided unfaithful partners with sophisticated cover stories to hide their affairs. With a long suspect list and intense media scrutiny, the higher-ups insist detective Benny Griessel be put on the case. In less than a week, a connection to a well-known family winery is found-- and tensions rise even higher. But Griessel must tread carefully; with so much attention on the case, if he makes one wrong move, his head could be on the chopping block. 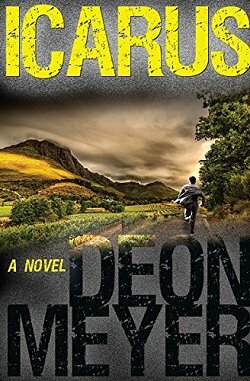 This is not the first book by Deon Meyer that I've read and enjoyed. One of his standalone thrillers, Blood Safari, is very good, and I distinctly remember reading one of his Benny Griessel mysteries-- but evidently, it was one in which Benny was on the wagon. You see, I have very few "buttons" that can be pushed when it comes to my reading. Due to personal experiences, the major button is main characters who are alcoholics. I don't like reading about alcoholics. In Icarus, Benny Griessel falls off the sobriety wagon big time, and I came extremely close to saying goodbye to this book. It says a lot about Meyer's strength as a storyteller that I decided to ignore Benny as best I could and read another page. Then another page. Then a chapter... all the way to the end. There are two timelines in this book. One takes the form of a rambling legal disposition that begins a few days after Richter's corpse was found. The second is the one of the investigation itself that starts as soon as the dead man is found. It was a bit slow going until the two timelines began to converge. Once that happens, the book picks up speed until its conclusion. It was fascinating to watch the investigation progress and to see the life and personality of the dead man (and others) unfold. Yes, I learned a lot about the history of winemaking in South Africa and about many other things. Meyer has created a strong story, but even though I did, in the end, rather grudgingly enjoy Icarus, I think I'll stick to his standalones. Sorry, Benny! I really do enjoy Meyer's way of depicting South African life. One day... book lovers' #1 song! One day, one day, in a month, six months, this year! My slogan, as true of all readers at the TBR lists grow into massive tomes and the TBR mountain ranges grow.